The Junior League of Kansas City, Missouri: women building better communities. Front row panelists: Leslie Whitaker and Jerry Vaughan. Second row panelists: Sudy Hurst and Jinny McCoy. 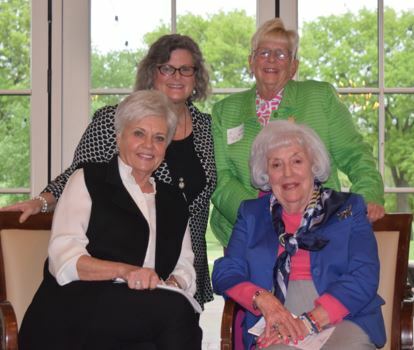 This year’s Spring Sustainer Meeting’s main event was filled with insightful stories of the past, told by four amazingly funny and brilliant sustainers: Leslie Whitaker, Jerry Vaughan, Jinny McCoy and Sudy Hurst; with Lisa Nickel moderating the conversation. Leslie explained that back then the League had a closed entrance process. It was an honor to join and the process and League activities were very secretive. Additionally, new member classes were about 20 people, contracts had to be signed to participate and everyone was required to work at the Thrift Shop, along with two other committees. Jerry said, “I had to wait two years to have a rush party. I was told to wear white gloves and my very best dress. When I got in, my father sent me a dozen roses! The second question, “What were the greatest issues you faced throughout your League career?” brought about insightful and thoughtful responses. Jinny helped women who were in the workforce integrate with the League. When she arrived, women who worked outside the home were not allowed to vote or attend meetings. The League didn’t even know what to call them. At one point they discussed referring to them as “Ladies of the Evening”, but fortunately settled on “Evening Actives” before simply allowing women who work the same benefits as those who didn’t. The panel concluded with closing thoughts. Our League is incredibly fortunate to have an incredible group of Sustainers who share a passion for service, pride in our community and commitment to building the potential of women. This entry was posted on May 9, 2017 by JLKCMO in Community Impact. Complete the Advanced Leadership Certification Series in One League Year!